Mexican Train is a variation of dominos that is very popular through the USA and can actually be bought in it’s own special pack with extra counters, pieces and more. 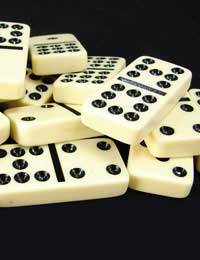 In order to play, a double twelve set of dominos needs to be used. This is every possible pair of numbers from 0 through to 12 and is a grand total of 91 dominos. Traditionally in order to play Mexican Train, people would use counters such as buttons or coins. These can still be used if you don’t wish to splash out on actual official counters, such as stream trains in various colours. At the beginning of the game, each player is asked to pick a certain number of dominos from the centre pile. If there are four players you must take 15 dominos each, five or six players take 12 each, seven or eight take 10 each and nine or ten take 8 each. Each player should look at the dominos they’ve chosen, but hide them from all other players. Any dominos that are left over should remain in the centre of the table, facing downwards. As always in most domino games, the way to start is by getting rid of your highest domino first. In this case, it is the 12-12 domino and that should be placed to indicate the start of the game. If nobody has the 12-12 then players must each take a turn of picking up a domino from the centre of the table until they find it. Each following round will start with the subsequently highest double left. Each player is then required to ‘form a train’, which means they start adding dominos to the played double, extending out towards themselves. They can continue doing so until they run out of matches for the exposed domino on the table. If someone is unfortunate enough to not be able to even start a train, they must place a marker down where they would have started it. This then means that when it’s the second round, anyone can start a train there. This is the only time you’re allowed to play on another players train, unless it is a Mexican Train. A Mexican Train can be started only after the first round. After every player has had one go at placing their train, the rules alter slightly so that now each player is only able to get rid of one domino at a time. This is why it’s good to get rid of as many dominos in the first round as possible. When you play your first domino of the second round, you’re able to place it on your own train, on someone else’s with the marker on it or on the Mexican Train as mentioned previously. A Mexican Train can be started by anyone and is basically a domino that has been placed at the centre double domino. It has to match of course and should have a distinguishing marker placed on it to show it’s a Mexican Train. If you don’t have any matching dominos, then you are allowed to draw one from the centre pile. You can play this if it matches any of the exposed dominos on the table and if it doesn’t match, you must pass your go and put a marker on your train. This then opens up your train to any player so that they may continue placing matching dominos onto it. If you then proceed to play a domino on your own train at a later stage in the game, the marker is then removed and from that point on only you are able to lay dominos on it. If you’re lucky enough to have a variety of doubles in your hand, you will get to also play an extra domino every time you put a double down. If you are unable to play it then you must draw a domino from the centre and place a marker on your train. If you play a second double after your first, you must then continue on with a third double. You only stop play when you no longer have any doubles to play and you must pass and place a marker on your train. You can end the game with your last domino being a double. Also, if you leave a train with a double exposed, then the next domino added must be added to this double. This action is commonly known as ‘satisfying the double’ and the onus of doing this falls to the person to the left of the player. If they can add to the double they must, if they can’t they need to draw from the centre pile and place a marker on their train. The duty of satisfying the double then passes onto the next player in turn. A great strategy for playing Mexican Train is to make the train as long as possible. If there are a large number of public trains, it may make it easier for opponent's to play down, so be careful with how many you're playing. If you can, play dominos in a way that as many trains as possible end with the same number of pips on them. This means that your opponent will find it more difficult to play down. Always play higher numbered dominos first so you're not left with them at the end of the game. Overall, play dominos on a public train rather than a private one if you have the choice as this means you may be able to use the private one when no other play is possible. Mexican Train is a relatively simple game to score. Basically, when one player runs out of dominoes or when the layout is so blocked it’s unplayable, that is when the game ends. Any spots left on the dominos are then counted and the player with the lowest wins the game. The game then continues for another 12 rounds and at the end the player with the lowest points is considered the winner.